Toronto, Canada, February 25, 2016 – Lingo Media Corporation (TSX-V: LM; OTCQB: LMDCF) (“Lingo Media” or the “Company”), an EdTech company that is ‘Changing the way the world learns English’ through innovative online and print-based technologies and solutions, is pleased to announce that it has been selected to the 2016 TSX Venture 50® and has been ranked #1 in the Diversified Industries category. Lingo Media achieved the greatest appreciation in both share price, gaining 745%, and in market capitalization, gaining 992%, amongst all 2016 TSX Venture 50® companies. “We are honoured to be recognized as a 2016 TSX Venture 50® company and to be ranked #1 within the Diversified Industries sector. It is a testament to our corporate vision and determination that we are generating results and exceeding expectations,” commented Michael Kraft, President & CEO of Lingo Media. “I would like to take this opportunity to thank our shareholders, customers and partners for their ongoing support and confidence in the Company. I would also like to commend our management team and staff for their focus, commitment and hard work. 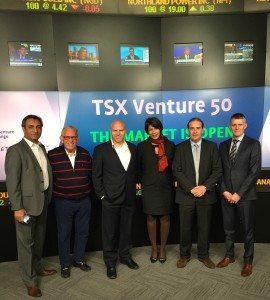 This TSX Venture 50® recognition adds to our expanding profile in the public markets and we are most appreciative of receiving this distinction,” added Mr. Kraft. The TSX Venture 50® is an annual ranking of the top 10 companies listed on the TSX Venture Exchange (TSXV) in each of five major industry sectors – Clean Technology, Diversified Industries, Mining, Oil & Gas and Technology & Life Sciences. The ranking is comprised of 10 companies from each of the five categories, selected based on a ranking formula with equal weighting given to market capitalization growth, share price appreciation, trading volume and analyst coverage. Visit the TSX Venture 50 website for the full list and video profiles of the 2016 honorees.